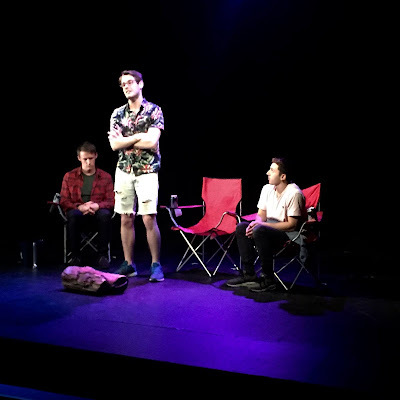 Theater in the Now: Review: It's a Brett World! Review: It's a Brett World! Kicking off the 19th edition of The Black Box New Play Festival 2016, The Gallery Players celebrates a night of works by emerging playwright Brett Epstein. Capturing the scribe's comic tone through big characters, the first weekend of The Black Box New Play Festival is a triple-header of fun. Beginning the night was a comedy for entertainment insiders entitled Representation. It's a slice of life comedy about the ridiculousness of the business with a long-winded cathartic punch line. Directed by Jesse Marchese, if you got the inside jokes, Representation resonated. If you didn't, then you asked yourself why the crowd was laughing along. Nevertheless, the company played into the pander pattern embracing the battle of breaking down the actors with silly adjustments. Standing out in the bunch was Kyla Walker as auditioner Claire. Walker took the notes in stride and brought out the humor in the juxtaposition. In the second offering of the night, Fire brought together two cousins and a third wheel boyfriend for a night out in the woods. Also directed by Marchese, Fire was essentially an exploration of the awkward silence. Henry and Max are polar opposite cousins who spend the night trying to acclimate as adults. Only insults and jabs are slung in comedic fashion. As Max, Steven Smith has great comic sensibility that seemed to channel the playwright himself. Smith stole the show, and the entire evening. Together, the plays brought out the best in Epstein while highlighting the similarities in his writing. The two pieces each brought a non-verbal button. Simply by pairing them up, Fire didn't end satisfactory. Though awkward silence may have been the mission. Marchese brought out the nuances of Epstein's comedic charm while keeping story in the forefront. The evening ended with a longer one act called Crisis: Ocean Planet. Inspired by the true story of a SeaWorld trainer killed by an orca, Crisis: Ocean Planet was a tonally confused piece. But where the tone issues originated is difficult to pinpoint. Director Brad Anderson, approached the comedy similarly to how the other two pieces were played. Through the darkness, the comedy worked. But there were moments in reality that the humor didn't feel genuine to the harsh circumstances. Crisis: Ocean Planet has a story that is hard to pull comfortable laughs from. But the company did what they seemingly were instructed to do. And there were laughs simply due to choices. The other added element Epstein integrated was framing a documentary around the tragedy. The way it’s currently played, it’s used as narration that simply could be removed with the context already in the plot. If this device is integral, it wants to be boosted or allow Bridget’s story to remain in the forefront. From a performance perspective, while he may not have been exactly what the narrative desired, David Frasure as Roger was sublime. His characterization was entertaining. As the central role of Bridget, Olivia Stoker offered an uninspiring performance. There is deep richness in the character but Stoker sadly didn’t do much with it. The first week of The Gallery Players’ Black Box New Play Festival 2016 was an exciting evening showcasing a fresh talent and a unique voice. If you don't know who Brett Epstein is, you should crawl out from under your rock and get educated. It's a name you'll hear often.